Considering that half of the songs on I’m Cooler Than You, Stop Making Fun Of Me were written in New York and the other half in Utah, it’s no surprise that the album is one of transition, mirroring Bassett’s experiences of location and emotional change. Songs such as “I Can Tell Already” are love songs to her friends in New York, whereas “Small Lake City” is Bassett’s ode to Salt Lake. “When you leave home, not only do you change, but everything changes while you’re not there, too,” she says. “Albatross” is a song about the fear of regret and the questions of “what if” that coincide with moving to a new place. 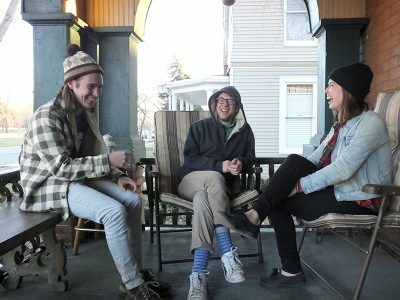 During this podcast, Bassett also describes how she met her fellow bandmates, Austin “Pasta Ryan” Mas and Andrew Maguire. Their story is both humorous and sweet, founded on true friendship and mutual talent. “Austin and Andrew are my best friends,” she says. “Bandmate is kind of secondary to that.” Even though the majority of their songs are melancholy, the bandmates are true jokesters and bring life and humor to their concerts. The track you’ll hear on this album is “I Can Tell Already.” You can check out Cat Ghost Formerly Known As Ghost Cat’s music at CatGhost.bandcamp.com or on Instagram with the handle @catghostformerlyknownasghostcat.